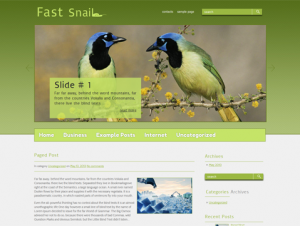 FastSnail is an amazing premium free WordPress nature theme, great solution for blog about nature. The theme comes with easy-to-use administrative panel and lots of configurations provide a great base to build on. We offer a wide variety of professional free WordPress themes. All our themes have unique designs, numerous useful plug-ins and editing functions. You can download and use all our themes for free, or purchase the theme for a links free version of the theme (free themes will have 3 or 4 links from our sponsors in the footer).